Willard Begel grew up the eldest child to a lower middle class family during the Great Depression in Lehighton, Pennsylvania. His father, Jacob, worked as a miller in a flour and feed mill, while his mother stayed at home in their rented house to take care of their four children: Willard, Catherine, Jacob Jr., and Kenneth. Before he was drafted at the age of 21 in 1943, Willard Begel worked as a welder in Lehighton. 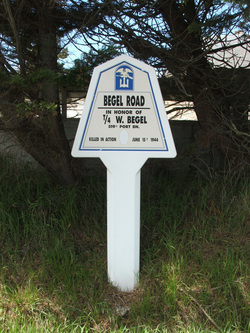 The Begel family was established in the area. Willard’s grandfather, Augustus Begel, was a railroad conductor who owned the family home in 1900. Later histories list him as the Sheriff of Carbon County from 1909 until at least 1913. Willard Begel graduated from Lehighton High School and went to work in the steel industry before being drafted in 1942. Before being drafted into the United States Army on July 13, 1942, Willard U. Begel was a member of the American arsenal of democracy. Pennsylvania’s industries played a major role in supporting the war effort. The U.S. possessed a tremendous industrial capacity that was geographically protected from invasion and bombing. This war of machines was driven in part by the industries that made up Pennsylvania’s cities and small towns. Pennsylvania’s industries produced a range of products for the war, including tanks, rations, and aviation fuel. The Philadelphia Navy Yard built ships to supply the U.S. Navy, including the battleships Washington, New Jersey, and Wisconsin. In 1943, Chairman Grace promised the government “a ship a day” stating that “war needs ships. The United States production of ships has been a prime factor in turning the tide to victory…and we are proud to have had a major part in the building of this magnificent fighting force.” Bethlehem Steel’s workforce exploded from 13,055 workers before the war to 31, 523 in 1943 at the main plant alone. The goal of “one ship a day” was met at its Maryland production facility. Organizing the supplies for war was a massive undertaking. The U.S. Army solved this problem in 1942 with a new division within the Army’s Services of Supply called the Transportation Corps. This division moved troops and cargo, supervised ports, and directed all types of transport. The Port Battalions were in charge of loading and unloading ships. On April 1, 1943, the 519th Port Battalion was formed. The men trained at Indiantown Gap Military Reservation, northeast of Harrisburg, Pennsylvania. The men who comprised the 519th Port Battalion were primarily draftees from the Midwest and mid-Atlantic. Port battalions usually included the oldest and youngest men eligible for service, along with African Americans, who served in segregated units within the Transportation Corps. 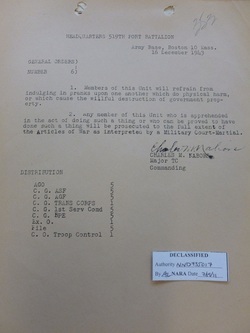 On October 7, 1943, the battalion was moved to Boston for further training at Camp Myles Standish. On June 6, the Allies were ready to make their landing on Normandy. The 519th Port Battalion was attached to the First Engineer Special Brigade. Intelligence reports began on June 8 from the First Engineer Special Brigade on Utah Beach. While Utah was considered the “safer” of the American beaches, it was far from peaceful. Reports note German artillery strikes and bombs dropped on the beach. The attack that killed Begel happened in the middle of the night on June 15, 1944. There was one German bombing raid that lasted from 2:10 to 2:50 a.m. and a second attack from 4:10 to 4:30 in the morning. Begel’s body was buried in a temporary grave the day that he died. His mother, Susan Begel, was notified of his death on June 27, 1944. Following his death on June 15, Begel was laid to rest in Sainte Mère Eglise. His mother chose to bury her son in France. His body remained there until April 21, 1948, when his remains were transferred to the Normandy American Cemetery, where he rests permanently. Willard U. Begel was 21 years old when he was drafted. He served as a Technician Fourth Class with the 519th Port Battalion. He died June 15, 1944 on the beaches of Normandy. Most people do not realize the dangers that come with being a part of a port battalion. Yes, these men are not directly responsible for winning battles or fighting against the enemy. But they provide the necessary food, weapons and other means of survival that keep the forces moving. According to War Department’s 1943 stevedore Training Manual, “military stevedores must be physically capable of maintaining their top speed and highest peak of efficiency for extended periods. Ships may arrive at any time of day or night and must be loaded and unloaded in any kind of weather. The stevedore must be good-natured…of rugged construction…have the ability to make decisions swiftly…and endowed with imagination and ingenuity…” Willard Begel possessed all of this. He was a man who people could look up to. That was his job, and he took it in stride, becoming a staff sergeant for the 304th Port Company. Willard Begel grew up in Lehighton, Pennsylvania during the Great Depression in a large, lower-middle class family. He had three siblings and two loving parents. He was the oldest. When he returned from seeing the world, he wanted to have a family, just like the one at home. Francis Marion Crawford once said this about fallen soldiers “They fell, but o'er their glorious grave, floats free the banner of the cause they died to save.” Today, we keep that banner flying as we pay tribute to the servicemen who died for America, and everything it stands for. Willard Begel, for your service and for your sacrifice, I thank you. The Albert H. Small Normandy: Sacrifice for Freedom® Student and Teacher Institute involved the opportunity to use the geography of Normandy to study the D-Day operation. By far, the two most powerful locations on the trip for our team were Utah Beach and the Normandy American Cemetery. We visited Utah Beach at high tide on a sun-drenched Sunday morning. This helped to bring the challenges of the life of a soldier in a Port Battalion to life. Utah Beach, despite its peaceful scenery, was a challenging place to work. Tides could vary from nine to as much as 24 feet. The beach could be as wide as 300 yards at low tide. Weather conditions could vary widely from day to day, with wind as a common challenge. The second major impression that the trip to the beach left was the vulnerable position of the men stationed on the beach. Once the initial phase of attack had passed and the German bunkers were neutralized, the soldiers on Utah Beach needed to continue their operations to keep the supplies moving. This work continued late into the night, and through all kinds of weather conditions. In addition, the German units were still in the vicinity. At the Normandy American Cemetery, it was humbling to see the thousands of graves. Here young men and women from all over the United States are laid to rest. The sheer enormity of the loss is made clear, as well as the obvious care that is taken to ensure a beautiful and peaceful resting place. Among the beautiful architecture and sculptures, we were struck with the number of graves of unidentified soldiers buried here. Here are men and women whose families do not have a grave to visit. 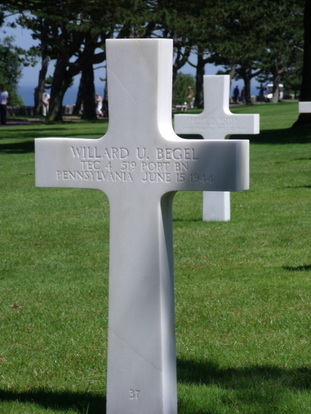 An interview with Maxine Begel, Willard's sister-in-law, confirmed that that two of Willard's brothers did go to Normandy and visit his grave before they died. We are happy to know that they saw his beautiful final resting place. 1st Engineer Special Brigade, S-2 Periodic Report, 8 June 1944 to 16 June 1944; Records of the Adjutant General’s Office, 1917-, World War II Combat Operations Report 1941-1946, Record Group 407; National Archives at College Park, College Park, MD. 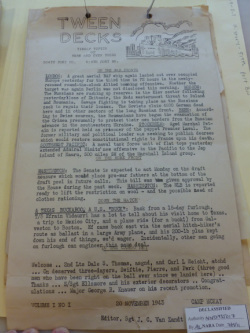 519th Port Battalion Historical Report; Records of the Adjutant General’s Office, 1917-, World War II Combat Operations Report 1941-1946, Record Group 407; National Archives at College Park, College Park, MD. Butler, Smedley D. “War Is A Racket.” New York: Round Table Press, 1935. Accessed August 1, 2011. http://explorepahistory.com/odocument.php?docId=1-4-18E. Pennsylvania. Carbon County. 1920 U.S. Census. Digital Images. http://ancestry.com. Pennsylvania. Carbon County. 1930 U.S. Census. Digital Images. http://ancestry.com. Pennsylvania. Carbon County. 1940 U.S. Census. Digital Images. http://ancestry.com. Records for Willard Begel; World War II Army Enlistment Records, 1938-1946 [Electronic File], Record Group 64; National Archives at College Park, College Park, MD [retrieved from the Access to Archival 2011 at http://aad.archives.gov/aad/series-description.jsp?s=3360&cat=WR26&bc=,sl, April 1, 2014]. Roosevelt, Franklin D. “The Great Arsenal of Democracy, December 29, 1940.” American Rhetoric. Accessed July 15, 2011. http://www.americanrhetoric.com/speeches/fdrarsenalofdemocracy.html. Weaver, Dave. Telephone interview with Lynne O’Hara. July 27, 2011. 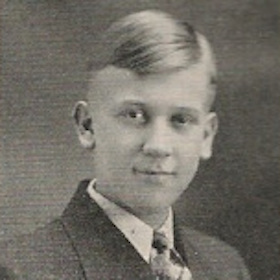 Willard U. Begel, 1938 Yearbook Photograph and Description. Courtesy of Lehighton High School. Willard U. Begel, Individual Deceased Personnel File, Department of the Army. Willard U. Begel, Official Military Personnel File, Department of the Army, RG 319, National Archives and Records Administration - St. Louis. “The Arsenal of America: Pennsylvania During the Second World War.” Explore Pennsylvania History. Last updated 2011. Accessed 15 July 2011. http://explorepahistory.com/story.php?storyId=1-9-19&chapter=1. Begel, Maxine. Telephone interview with Carson Rolleri. July 21, 2011. Bethlehem Steel: The People Who Built America. Produced by Amy Burkett. Public Broadcasting System, 2003. Film. Brozyna, Andrew. Telephone interview with Carson Rolleri and Lynne O’Hara. April 12, 2011. Ibid. Longshore Soldiers: Life in a World War II Port Battalion. Longmont: Apidae Press, 2010. “Distinguished Alumni: Eugene Grace.” Lehigh University. Last updated 2016. Accessed December 29, 2016. http://www.lehigh.edu/engineering/about/alumni/grace.html. “Willard U. Begel.” American Battle Monuments Commission. Accessed March 25, 2011. https://www.abmc.gov/node/406810#.WGUYyxsrLIU.